I know, I know. Rhubarb season is over :( But I made these guys earlier this summer and if I don’t post them now, the recipe will certainly disappear into the abyss before spring rolls around again! So if you can get your hands on any rhubarb, have at ‘em… otherwise, I’m putting this here just for safe keeping! Once, with a bunch of rhubarb gifted to me from a neighbor, I stumbled upon and made this recipe for Rhubarb Dream Bars. 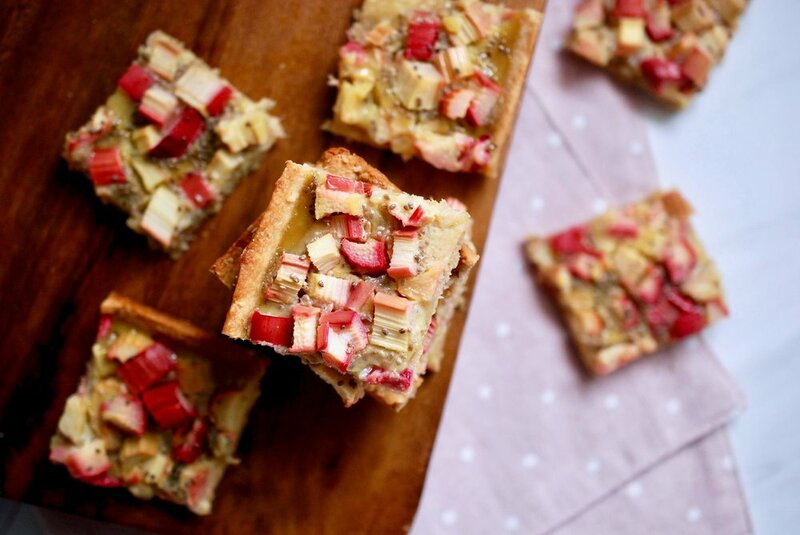 They are kind of like lemon bars (shortbread crust, custard-y filling), except with rhubarb! The first time I made them, I think ZB and I ate half of the pan in one day! I love dessert… and don’t get me wrong, I love dessert with lots of butter and sugar and white flour. But sometimes I just want to play around with taking a recipe I already know and love and making it with more of an unprocessed / whole foods approach! 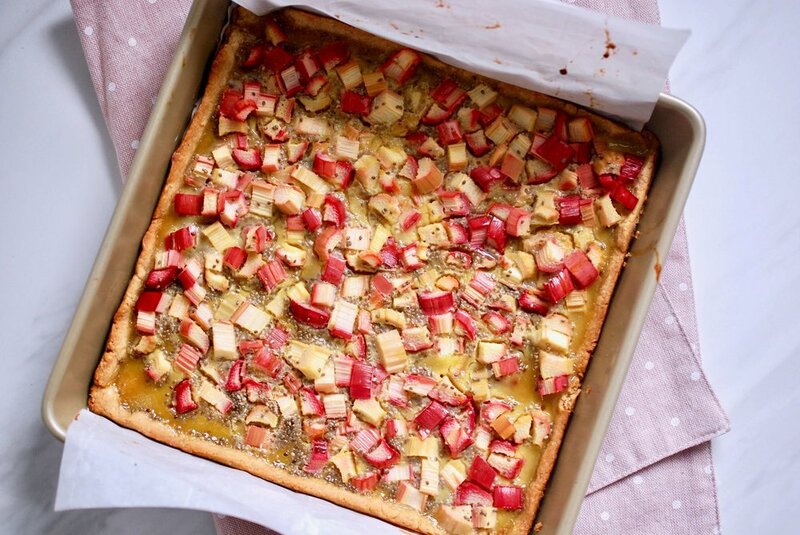 This Rhubarb Bar remix turned out so well! I used coconut butter, oats, and almond flour in the crust, honey to replace the sugar, and arrowroot and chia seeds to thicken the filling. 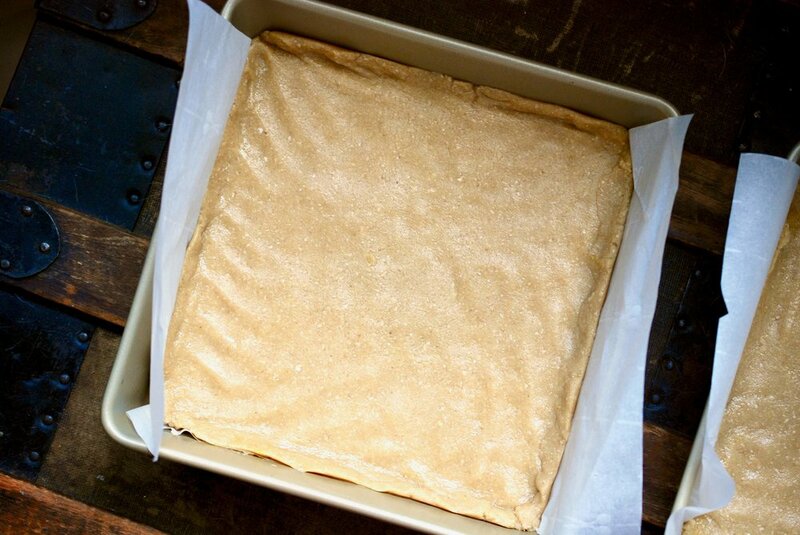 Line your pans with parchment paper to make removing the bars easier. When you press the crust into the pans, do your best to make the crust come up the sides about 1/4” - 1/2” — since the filling is pretty liquidy, you want to try to contain it within the crust! Preheat oven to 350 degrees Fahrenheit and line two 9x9 pans or one 9x13 pan with parchment paper. In the bowl of your food processor, process oats until they break down into a fine flour. Add in almond flour, coconut butter, honey, egg, and salt. Process until a soft dough forms. Press dough into the bottom of the pan, allowing the crust to come up the edges between 1/4” and 1/2” to contain the filling. Pre-bake the crust for 10 minutes or until it starts to slightly pull away from the sides of the pan. In a medium bowl, whisk together eggs, honey, arrowroot starch, and chia seeds. 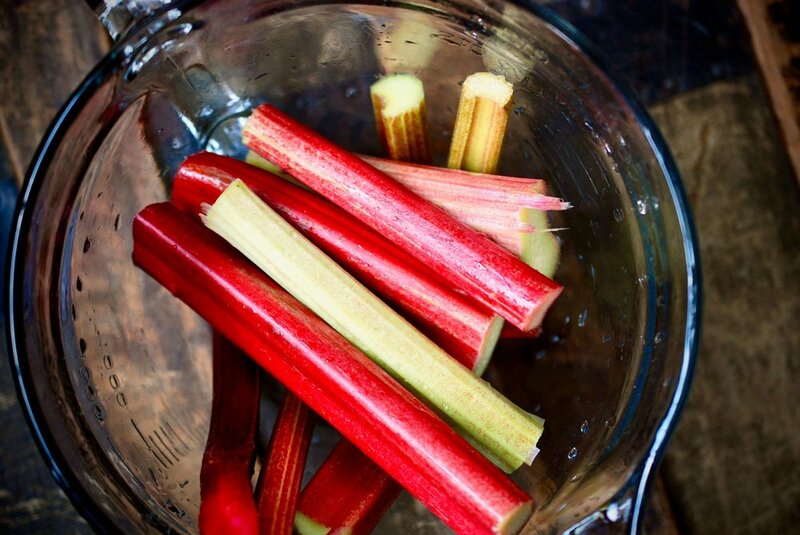 Chop rhubarb into small, uniform pieces and fold into the egg mixture. After the crusts have come out of the oven, divide the filling equally between the two pans, equally distributing the rhubarb over the crust, and trying to get an even covering of the egg mixture. Lower oven to 325 degrees Fahrenheit and bake for 20 - 25 minutes or until the filling is set. Chill, cut into squares, and serve! 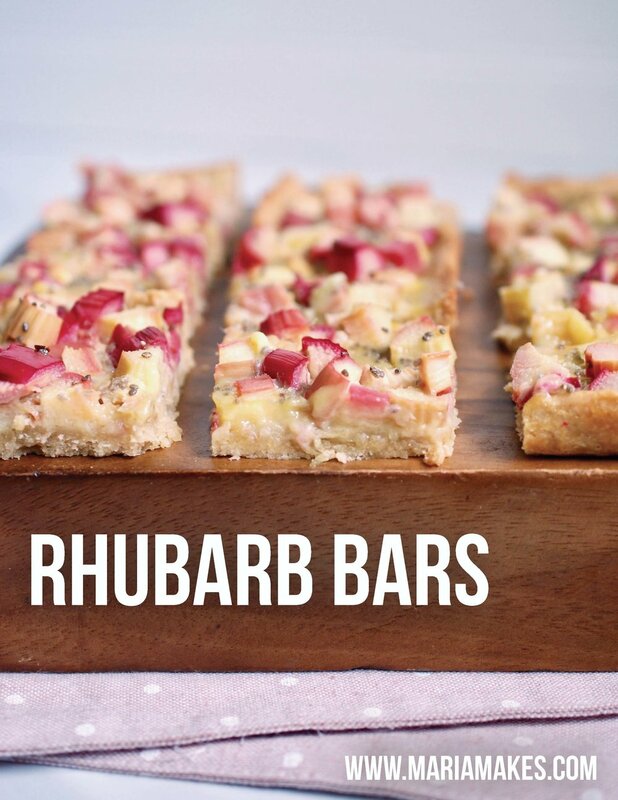 Rhubarb Bars – Maria Makes: Make the most of rhubarb season with these tangy and sweet bars, free of refined sugar and refined flour, a healthy remix that is full of good-for-you ingredients and oh so tasty!